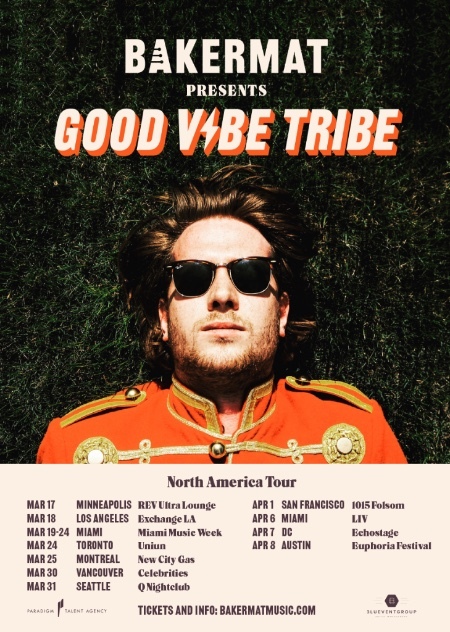 Bakermat will kick off his Good Vibe Tribe tour of North America on 17th March in Minneapolis, before concluding on 8th April at Euphoria Festival in Austin, Texas. The Dutchman is making his return across the Atlantic to include dates in Miami, Los Angeles, Montreal and Washington DC. Last week, Bakermat released his first single of 2017 entitled ‘Baby’ out now via Dirty Soul/B1 Recordings/Ultra Music. His single ‘One Day (Vandaag)’ has accrued over 47 million Spotify plays, made the Top 5 of several European singles charts and went platinum in Germany. Bakermat sampled the vocals of Grammy Award winning vocalist Shirley Caesar for his follow-up tune, ‘Teach Me’. His recent single ‘Living’ features the vocals of British singer/songwriter Alex Clare. See if Bakermat is hitting your city and stream his new track ‘Baby’ below.